Weekdays are for making plans, weekends are for enjoying life. At least, that's according to the women we surveyed as part of the 2015 POPSUGAR Insights Food study. 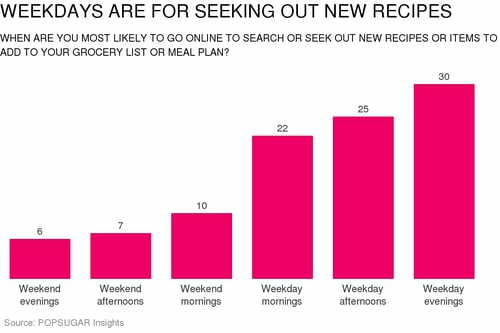 Nearly 8 in 10 women said that they are most likely to go online to search or seek out new recipes and food items to add to their grocery list or meal plan on a weekday. Weekday evenings were the most popular time of week for discovery, with 30% of women saying that's when they seek out new recipes. Evenings were followed closely by weekday afternoons (25%) and weekday mornings (22%). Weekends were less popular, with only 23% of women saying they go online to seek out new recipes and food items. Of women who did select weekend options, weekend mornings were most popular (10%), followed by afternoons (7%).